I watched this movie with two of my friends during my birthday celebration. I got to highlight that this is not my choice of movie given it's sad and emotional content. I did not know about this novel initially until I read the plot. I think this could be a movie you watch during your regular days, but it just does not feel right for a birthday outing. On a side note, we were supposed to visit trick eye museum but the tickets were sold out very fast. To cut the long story short, my friend suggested to watch a movie. To my disappointment, X men ticket was sold out very fast by the time. In the end, my friend suggested watching this movie instead. Okay, I did thought about not going but I gave my benefit of doubt that this could be a good movie. On a second thought, money was spend already and I can write a review about this movie. Thinking from that angle, I felt better instead of grumbling about it. As a matter of fact, we do not have much of a choice for a 'last minute' movie ticket purchase during a weekend. 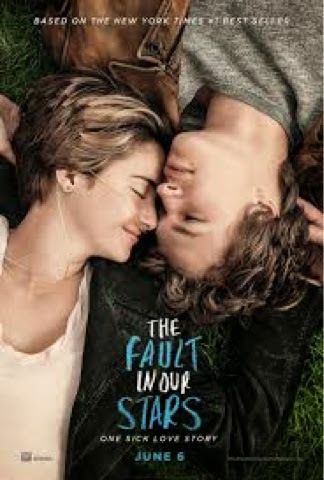 Based on a best selling book by John Green, The fault in our stars is a teen love story with a little twist. It is not just an ordinary romance movie when both the main characters were sick. Shaileen Woodley takes the lead as Hazel Grace Lanchester. She was terminally ill with cancer since young, miraculously her condition stabilize after experimenting with some prescribed drugs medication. Now 17 years old, she reluctantly joined a cancer support group and met a confident young man named Agustus Waters played by Ansel Elgort. Together they went for an adventure in Amsterdam to look for the celebrated author Peter Van Houten. Will their dreams come true? What will happen to the main characters? Will there be romance in the air? What will they encounter during this trip? Is there any life transforming experiences? Those questions will be answered when you hit the movie threate. First of all, I got to give credit to the author John Green and the director of this movie Josh Boone. They set the mood in a postitve atmosphere despite the depressing storyline. There were some scenes when the characters struggled with the pain and suffered because of their illnesses. However, that was not what the story is about. It is the message the story is trying to bring to the audience. There is a profound meaning in afterlife and how we face death. The search for the answer and philosophy of life. It is also about how the living deal with the death of a love one. The main characters did not wallow in self pity and live their life to the fullest. There were some heartbreaking and romantic scenes. For those who are sentimental, please bring along a packet of tissue to the movie theatre. Ansel Elgort and Shaileen Woodley acted very well in their respective role. They were attractive and charming in their own ways. I heard that they worked together in the Movie Divergent before this movie and their chemistry was evident. I did not watch their movie before and I have never read this novel, therefore I watch this movie in a fresh piece of mind. Their collaboration feels natural and I can connect to the main characters. Nat Wolff was great as the best pal of Ansel Elgort character Gus. He brought some humor relief in the otherwise depressing movie. The cast really gave an outstanding performance that is worthy to nominate for a movie award. In my opinion, there were some corny or cheesy scene in movie. I may not be too emotional with those touching scenes. That is just me perhaps but there are people who sniff their nose towards the ending. This is a highly recommended movie for fans of the novel.